WHO AND WHAT IS THE MAYORAL FORUM? 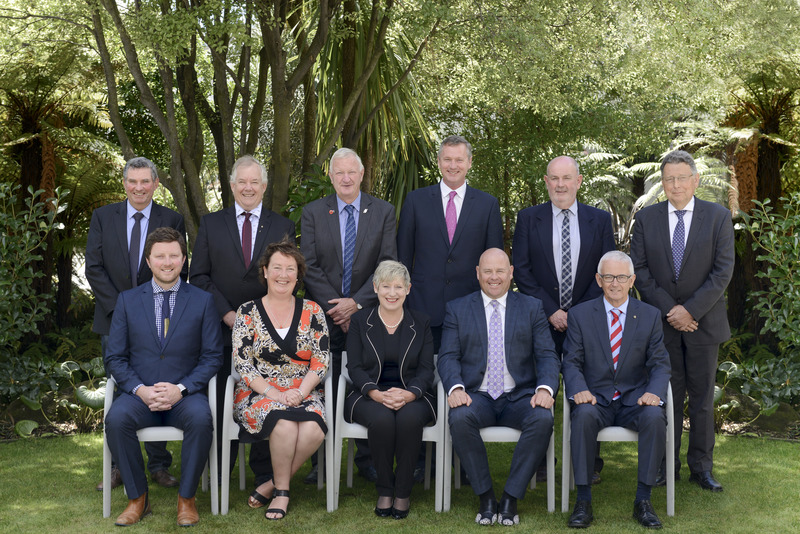 The Mayoral Forum comprises the mayors of the 10 territorial authorities in Canterbury and the chair of the regional council (Environment Canterbury). Chief Executives attend Mayoral Forum meetings to support their mayor/chair. The 11 member councils are Kaikōura District, Hurunui District, Waimakariri District, Christchurch City, Selwyn District, Ashburton District, Timaru District, Mackenzie District, Waimate District, Waitaki District (part of which lies within the Canterbury Regional Council area), and the Canterbury Regional Council (Environment Canterbury). On 27 January 2017, the Forum elected Lianne Dalziel, Mayor of Christchurch City, as its chairperson for 2017–19. The Deputy-Chair is Damon Odey, Mayor of Timaru District. The Forum meets at least quarterly, and is supported by the regional forums secretariat hosted by Environment Canterbury. Front row, L to R: Sam Broughton (Mayor, Selwyn District Council); Donna Favel (Mayor, Ashburton District Council); Lianne Dalziel (Mayor, Christchurch City Council – and Chair, Mayoral Forum 2017-19); Damon Odey (Mayor, Timaru District Council – and Deputy-Chair, Mayoral Forum 2017-19); David Ayers (Mayor, Waimakariri District Council). Back row, L to R: Graham Smith (Mayor, Mackenzie District Council); Craig Rowley (Mayor, Waimate District Council); Winton Dalley (Mayor, Hurunui District Council); Gary Kircher (Mayor, Waitaki District Council); Winston Gray (Mayor, Kaikōura District Council); David Bedford (Chair, Environment Canterbury). David Bedford stepped down for health reasons during 2017 and subsequently passed away in February 2018. Steve Lowndes stepped in as acting chair of Environment Canterbury, then was elected as chair in November 2017 when Mr Bedford resigned. WHAT DOES THE MAYORAL FORUM DO? work together, and with central government and other key sector leaders in Canterbury, to meet the needs and expectations of our communities at the lowest possible cost to ratepayers. WHAT HAS THE MAYORAL FORUM ACHIEVED? In 2008, the Mayoral Forum initiated the Canterbury Water Management Strategy (CWMS) with its vision: To enable present and future generations to gain the greatest social, economic, recreational and cultural benefits from our water resources within an environmentally sustainable framework. The CWMS is led by Environment Canterbury, Ngāi Tahu and the region’s territorial authorities. Environment Canterbury reports quarterly to the Mayoral Forum on implementation of the CWMS. Working together on the CWMS built relationships and trust between local authorities in Canterbury. Councils then began to explore opportunities for shared services on a regional or sub-regional basis, and developed a joint three-year work programme. This in turn laid the foundation for working together on the Canterbury Regional Economic Development Strategy (CREDS). The CREDS was launched in August 2015, and refreshed and re-launched in June 2017 for the 2017–19 local government term. In May 2018, the Mayoral Forum reviewed its progress mid-term in implementing the Canterbury Local Authorities’ Triennial Agreement 2017–19 and the CREDS.